I’m determined not to let having a new baby mean I have to give up my hobbies of baking and card baking but at the moment I definitely have very little time for either! There are lots of things you can make that are quick and easy and take minimal fuss though, like these decorated sugar cookies for Easter. We had some friends visit for a couple of hours last Sunday afternoon; they had said they would bring some cake but I also wanted to be able to offer something as well, but didn't know if I would have time to make even a simple cake, and wasn't sure what they were going to bring and didn't want to make the same thing, so cookies seemed the answer. 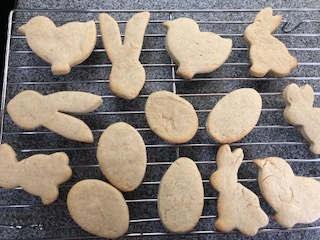 I already had some biscuit dough in the freezer from a previous recipe pre-baby (which I don’t seem to have blogged about); here's a basic sugar cookie recipe you can use, though you can add other flavourings like a bit of lemon zest or butterscotch flavouring, vanilla essence and so on. Cream the butter and the sugar and beat in the egg. Then fold in the flour until you have a pliable dough. 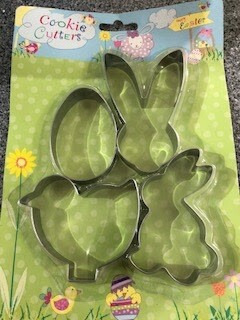 Keep in the fridge until you need to use and roll out to use with cookie cutters. The size and thickness of the cookies will dictate how long they would need to bake in the oven but I would usually give them 8-10 minutes at 180C as they will continue to harden as they cool out of the oven. 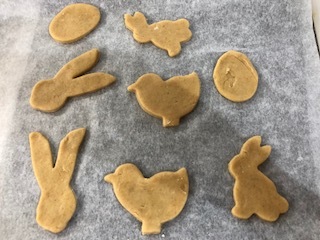 I defrosted my dough and used a set of Easter cookie cutters I bought last year (or maybe even the year before) from one of the pound shop chains and had never used. The set included two different bunnies, a chick, and an egg. They took no time at all to cut out and bake in the oven and I decided they needed decorating even if I didn't have a lot of time until our friends arrived - or until the baby woke up and wanted feeding again! 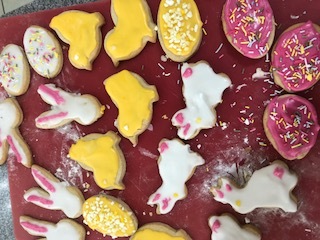 So I mixed some icing sugar with water and added some different food colourings and did my best to ice the biscuits with a teaspoon (I didn't have time to faff around with piping and flooding properly!) and added a few sprinkles on top. 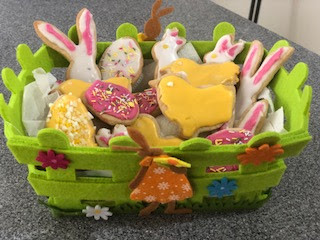 They aren't particularly neat, but tasted good which was the main thing, and the presentation was helped by this cute little felt Easter basket I bought for a couple of pounds in Lidl last year.